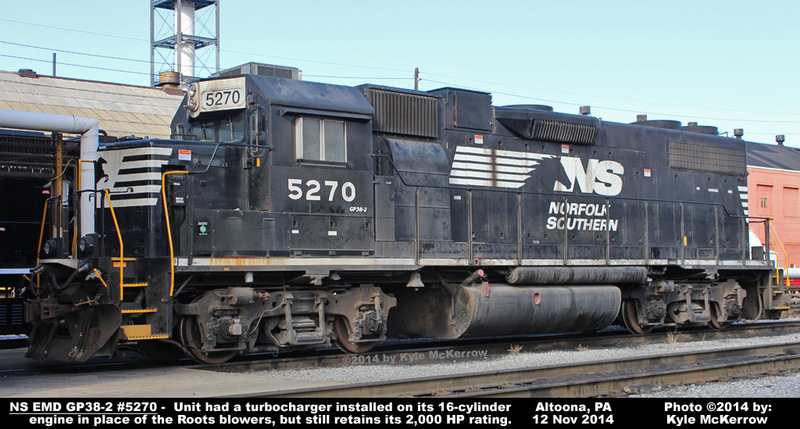 5257 CR 8040 PC 8040 PRRX 02-1973 72627 72627-1 Rebuilt with NS "admiral" cab and low short hood. NS LEADER/PTC equipped, Equipped for remote control operation. 5258 CR 8041 PC 8041 PRRX 02-1973 72627 72627-2 Rebuilt with NS "admiral" cab and low short hood. 5259 CR 8042 PC 8042 PRRX 02-1973 72627 72627-3 Lettered for Norfolk Portsmouth Belt Line (NPBL), which is partially owned by NS. 5260 CR 8044 PC 8044 PRRX 02-1973 72627 72627-5 Lettered for Norfolk Portsmouth Belt Line (NPBL), which is partially owned by NS, and painted in special NPBL heritage paint scheme. 5261 CR 8046 PC 8046 PRRX 02-1973 72627 72627-7 Rebuilt with NS "admiral" cab and low short hood. 5266 CR 8054 PC 8054 PRRX 02-1973 72627 72627-15 See note at bottom of roster regarding engine configuration. 5267 CR 8056 PC 8056 PRRX 02-1973 72627 72627-17 NS LEADER/PTC Equipped. 5269 CR 8058 PC 8058 PRRX 02-1973 72627 72627-19 NS LEADER/PTC Equipped. 5270 CR 8060 PC 8060 PRRX 02-1973 72627 72627-21 Turbocharged - see note below regarding engine. Unit currently stored undergoing cab replacement. 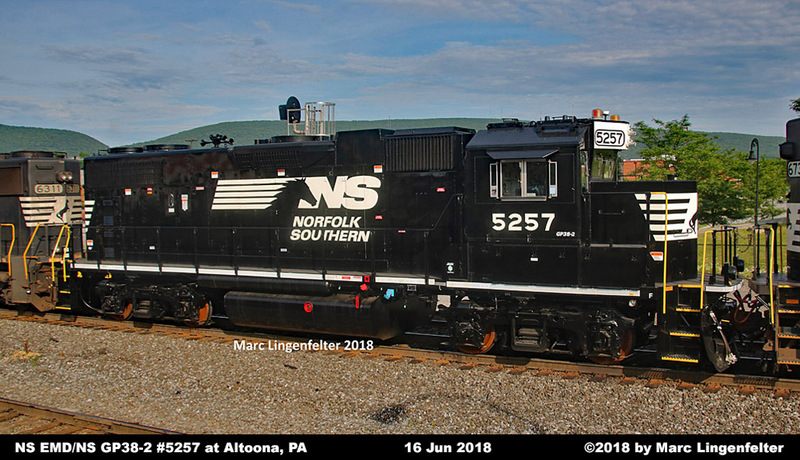 5274 CR 8066 PC 8066 PRRX 02-1973 72627 72627-27 Rebuilt with NS "admiral" cab and low short hood. NS LEADER/PTC Equipped. Unit currently stored, but still on the active roster. 5277 CR 8070 PC 8070 PRRX 02-1973 72627 72627-31 NS LEADER/PTC Equipped. 5283 CR 8081 PC 8081 PRRX 02-1973 72627 72627-42 NS LEADER/PTC Equipped. 5285 CR 8084 PC 8084 PRRX 02-1973 72627 72627-45 NS LEADER/PTC Equipped. 5286 CR 8085 PC 8085 PRRX 02-1973 72627 72627-46 NS LEADER/PTC Equipped. 5289 CR 8089 PC 8089 PRRX 02-1973 72627 72627-50 Rebuilt with NS "admiral" cab and low short hood. 5290 CR 8090 PC 8090 PRRX 02-1973 72627 72627-51 Unit currently stored at Roanoke, VA with collision damage. 5293 CR 8097 PC 8097 PRRX 02-1973 72627 72627-58 Rebuilt with NS "admiral" cab and low short hood. 5296 CR 8102 PC 8102 PRRX 02-1973 72627 72627-63 Rebuilt with NS "admiral" cab and low short hood. 5301 CR 8113 PC 8113 PRRX 02-1973 72627 72627-74 Re-powered - see note below regarding engine. Unit currently stored, but still on the active roster. 5302 CR 8117 PC 8117 PRRX 02-1973 72627 72627-78 NS LEADER/PTC Equipped. 5304 CR 8119 PC 8119 PRRX 02-1973 72627 72627-80 NS LEADER/PTC Equipped. 5310 CR 8127 PC 8127 PRRX 02-1973 72627 72627-88 NS LEADER/PTC Equipped. 5311 CR 8128 PC 8128 PRRX 02-1973 72627 72627-89 NS LEADER/PTC Equipped. 5313 CR 8131 PC 8131 PRRX 02-1973 72627 72627-92 NS LEADER/PTC Equipped. 5316 CR 8136 PC 8136 PRRX 03-1973 72627 72627-97 Unit currently stored, but still on the active roster. 5326 CR 8154 PC 8154 PRRX 10-1973 73608 73608-1 Received wreck repairs that included a replacement long hood from a former NS/Southern unit. 5338 CR 8171 PRRX 06-1977 767077 767077-9 Rebuilt with NS "admiral" cab and low short hood. 5353 CR 8207 PRRX 07-1978 777126 777126-6 Unit currently stored, but still on the active roster. All units were upgraded with an electric parking brake. 16-cylinder 645E engine with manual fuel injection. It was released back into service 03/2016. Interstate Electronic Fuel Injection (EFI) system. It retains its 2,000 horsepower rating. 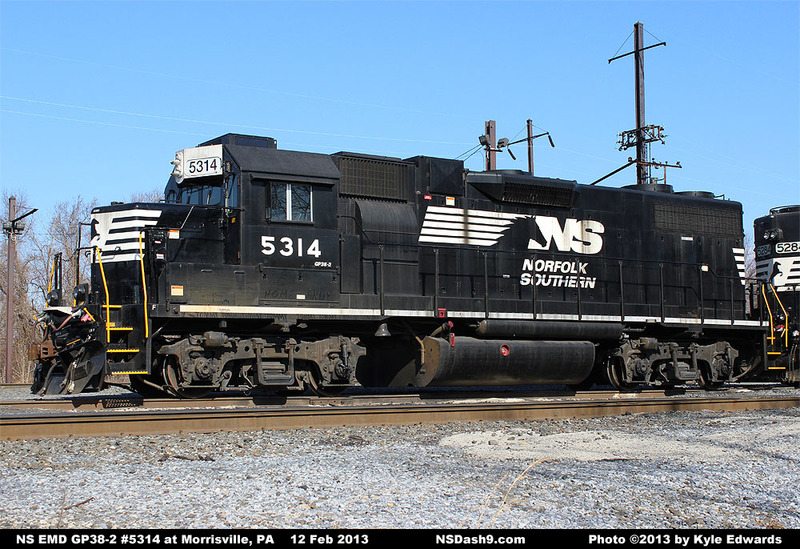 NS 5301 was re-powered with a EMD turbocharged 8-cylinder 710G3A ECO engine and released 10-2013. Unit also received the NS-designed split cooling system.